With a Potterton Suprima boiler which was repeatedly locking out and having to be re-set we expected to find that this was a circuit board problem as older Potterton Suprima boilers were famous for this. It's a problem which affects the old style Suprima circuit boards not the circuit board which Potterton eventually, and belatedly, had re-designed by Siemens for the Suprima boiler. The boiler we saw was in a garage, not enclosed in a cupboard. It clearly still had the old style circuit board, in fact one of the earliest circuit boards fitted to the Potterton Suprima, with a membrane panel which has to be pressed to re-set the boiler if it locks out. Occasionally we find Suprima boilers where the membrane panel has been pressed so many times that the plastic membrane carrying the word "Reset" has broken away. The "99" on the lower right of the data plate in the photo is a manufacturing year code. We removed the screw (top left in the photo) which allows the control panel to flip down and inspected the board, expecting to find the classical darkened scorch mark which is typical of Potterton Suprima circuit boards of this type. This board showed only very slight darkening. Re-setting the boiler by pressing the Reset panel (you can also isolate the power temporarily to reset it) we watched to see if it would lock out. It attempted to go through the ignition cycle 3 times before locking out. This indicated an alternative likely cause for the lockout, a failing ignition lead. We looked to see which type of ignition lead this boiler carried. The early leads were composed of a graphite core formed round glass fibre thread and covered with a red, rubberised insulation. These are the Suprima ignition leads which give lockout problems. The later, more conventional leads (translucent plastic round a metal core), are fine. The problem with the red leads is that the carbon breaks away. The ignition lead in the photo had cracks through the carbon but often the carbon just beyond the red insulation (between the insulation and the spade connector) breaks away, leaving just the glass fibre core with carbon particles clinging to it. When the high tension current is sent through the lead to create the spark, the very high voltages (maybe 10,000 to 20,000 volts) enable the current to jump the gap in the broken carbon conductor in the same way as it jumps across the ignition electrodes. This lights the burner. The red ignition lead serves a second purpose. When the burner has lit, and only when it has lit, a small low voltage flame rectification current passes along the lead and is sensed by the circuit board. This current indicates the presence of a flame and the circuit board allows gas to continue to pass from the gas valve. If the flame rectification current is not sensed by the circuit board the board will shut down the ignition sequence and go through the process again, three times in all. If the presence of a flame is not detected within three attempts the boiler will go to lockout. 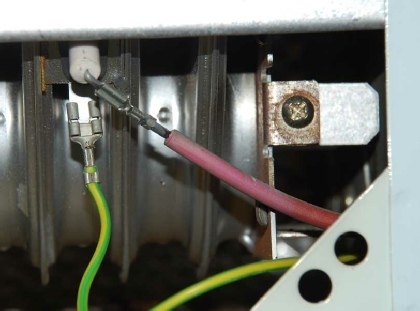 When the carbon conductor is broken or substantially cracked, the low voltage flame rectification current is unable to jump the gap in the conducting path and the circuit board is not able to sense the current. After three attempts it locks out. The remedy was a simple, just a replacement new style ignition lead, and the boiler worked fine. We suspect that the reason this circuit board (printed circuit board, pcb) has lasted so long is that the garage that houses the boiler is shaded and very cool and there is lots of free air round the boiler. In our experience these early boards have a shorter life span if not cooled well. When we looked at the boiler the red light only was flashing twice per second. The fact that this Potterton Suprima boiler refused to re-set either by pressing Reset or by switching off and back on the mains power supply to the central heating system suggested that this was not a Suprima ignition lead problem. The boiler we saw was in a tight enclosed cupboard with no ventilation. It clearly still had the old style circuit board, again one of the earlier circuit boards fitted to the Potterton Suprima, with a membrane panel which has to be pressed to re-set the boiler if it locks out. The data plate carried a "00" year code indicating it was manufactured in 2000. We removed the screw which allows the control panel to flip down and inspected the board, finding the classical darkened scorch mark which is typical of Potterton Suprima circuit boards of this type. 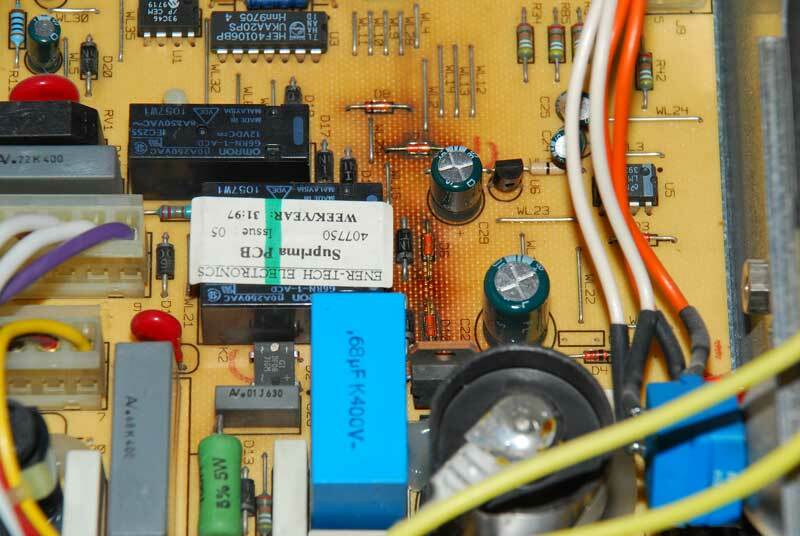 This board was one of the most scorched Suprima circuit boards we have seen. Interestingly, the customer had fitted this "re-furbished" board about 5 years earlier after his previous Suprima circuit board had failed. This board carried a 1997 date code. Fitting re-furbished circuit boards is possibly risky and may be illegal though we can understand the temptation given the excessive amount Potterton charge for the Siemens designed circuit board. It’s our understanding that any person working in Great Britain on a domestic gas boiler must be competent and, if working commercially, must be a member of the Gas Safe Register. “We have been made aware that sometimes controls, which have not been tried and tested to the appliance manufacturer’s specification, are being used as replacements as they ‘appear to work OK’. This is a dangerous practice. Both Gas Safe Register and HHIC urge registered gas businesses/engineers not to use controls other than those approved for use with the appliance in question. The safety and performance of appliances cannot be assured if the appliance manufacturer’s recommended parts are not used at all times. Gas Safe Register and HHIC are confident that responsible businesses/engineers will acknowledge that the decision to fit a part should be based on safety and specification rather than solely on grounds of cost and convenience. We fitted the new circuit board designed by Siemens and supplied by Potterton for the Potterton Suprima, complete with chassis and wiring loom. An expensive repair but the boiler worked fine. We've added this fault because the way it presented was unusual. Our customer reported that the boiler would fire normally in the morning for about 15 minutes before shutting down. It would then refuse to do anything at all for several hours, firing again in the evening. The programmer was calling for heat and showing red LEDs for both hot water and central heating circuits. The room thermostat was turned up to maximum. Since the boiler was in a "failed" state when we arrived we were able to find the fault very quickly. Despite neither a red or green light on the circuit board, the programmer showed two red lights so the main fuse for the heating circuit was intact. We turned the mains switch off and on again to see if it would reset the pcb but it didn't work. We could, however, hear a relay clicking on the circuit board. With the power turned off again we removed the on board fuse from the pcb and checked it for continuity. It was not blown. We refitted it and powered up again but still no lights. Using a multimeter we checked between permanent live and neutral and found 238 volts, fine. Checking between switched live and neutral we again found about 240 volts. This guaranteed that the fault was the Enertech circuit board. Checking for live with a neon is not enough as you don't know whether you have lost the neutral return path. Using a multimeter between live and neutral proves that the neutral is OK too. We changed the circuit board for the new Siemens board and the boiler worked fine. The reason we added a report on this boiler is because we'd never seen a Potterton Suprima pcb go dead with no lights at all; normally you end up with a flashing or fixed red. The pump would not cut in and it just sat there. I fitted a new pump in 2003 so did not suspect that. I did check it out and it rotated freely. 'Fiddling' with the boiler I managed to get it to spark up and run, for a short time. The pump would intermittently cut out, which I thought odd as the temperature had not yet satisfied the thermostats. (HW and CH). I had my heating chap round who suspected a thermistor fault, I wasn't sure about that as there were other symptoms. After some time the boiler again would be demanding heat but not spark up. I managed to get it to go sometimes by unplugging it from the mains for a bit then plugging it in again. I suspected the PCB was at fault because it was not telling the pump to start and hence it would not attempt to light. The three-way-valve operated okay and I had bled the system, although there was no air ejected. I did some research on the net and found another case of a faulty PCB on the new upgrade kit where the PCB is in a sealed plastic box and made by Siemens. The symptoms on the post I read were exactly the same as mine. To cut a long story short, I bit the bullet and paid out for a new PCB (£176) and a new thermistor (£12) just in case. I fitted the new thermistor, no difference. I then fitted the new PCB, went through the correct start up procedure and the boiler did what it was supposed to do and ran properly. I have been testing it over the past two days with the HW only, CH only and both. Everything now seems okay. I thought I should let you know as on your website you only refer to problems with the old PCB and not those with the new upgrade kit. It appears there might be a problem with the new PCB's too! Or it could be the environment they operate in. Locating a PCB on the side of a boiler is not a good choice, at the bottom would be better, as I'm sure you are aware PCB's like to be cool. That is why we have fans in our computers and on our graphics cards! I am a Marine Engineer, (IEng IMarEng MIMarEst) and am used to diagnosing and repairing problems on all sorts of ships' machinery, including domestic (oil fired) as well as main steam generating boilers. Unfortunately Potterton don't seem to recognise my extensive experience and high engineering qualifications as they would give no advice to me when I rang them. That said, the 'tech' chap I spoke to did intimate from the symptoms I described to him that the PCB was probably the fault. Perhaps I can understand their reluctance to give more advice as I'm not 'Gas Safe' registered but their attitude was one of dismissal informing me that the new PCB's only have a warranty of one year! As I told them, one would think that a new upgraded part that cost £220 should last longer than three years. I will be writing to them in due course about my displeasure of their so called 'customer relations'. I thought I would let you know that it is not only the old PCB in the Suprima but there might also be a problem with the new one too! We were called out to a Potterton Suprima 60L boiler that wouldn't fire up. The boiler was 4 or 5 years old and fitted with the new style, Siemens PCB. It showed a solid red lockout light. After resetting it would attempt the ignition cycle, starting the fan, but would promptly fail, bringing up a solid red light again. 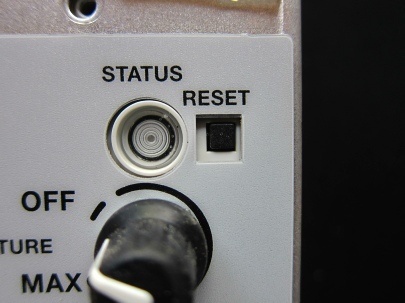 Holding the reset button in for 10 seconds puts the PCB into diagnostic mode. We then got a red light flashing fast (3 or 4 times a second). The boiler manual says this is an air pressure switch (APS) fault or a flow switch fault. 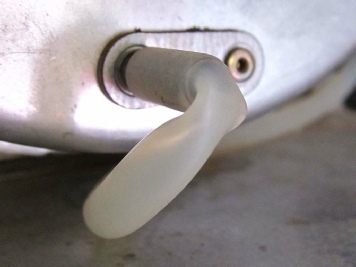 The flow switch is also known as a dry fire switch. It's purpose is to prevent the boiler firing if the heat exchanger is dry or if the water is not circulating through the heat exchanger. We suspected the pump. We measured a correct 236V AC between Pump Live and Neutral at the boiler during the ignition attempt. Going upstairs to the airing cupboard we listened to the pump during the ignition attempt (using a screwdriver between pump body and ear). It was humming and not turning. Changing the pump speed settings altered the hum but it still would not turn. The Grundfos 15.50 pump was also only about 5 years old but it had failed. Removing the large chromed plug in the front of the pump (Grundfos pump page) we freed the pump spindle but it still only struggled to turn occasionally. Changing the pump for a Grundfos 15.60 high head pump sorted the problem out and the boiler fired up and worked normally. Most Potterton Suprima boilers do not have a flow switch fitted. The diagnostics said it was a flow switch fault. The wording could have been better. The Suprima flow switch was working fine; it was simply indicating that there was a fault elsewhere. This was an older Suprima 40 boiler (1996) which had had a new Siemens PCB kit fitted by us 2½ years earlier (April 2011). The boiler was flashing red but it was a very slow flash we haven’t seen before; 3 seconds on and 1 second off is really slow. Using the square reset button on the boiler made no difference and holding the reset button in for more than 10 seconds (to access any stored fault codes) made no difference. Completely shutting off the power to the boiler sometimes allows troublesome PCBs to reset but, again, it made no difference. Continuous red indicates a PCB fault. 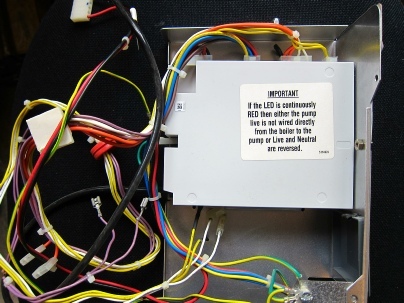 According to a note on the side of the PCB, continuous red can also indicate that the Pump Live is not wired directly from the boiler or that Live and Neutral are reversed (polarity). In our case, none of the above fault light codes applied and we rang Potterton Technical for advice. After the usual “due to the high volume of calls it may take some time to answer” message (in August? ), they answered within a minute, so no complaints there. The adviser seemed surprised by the fault we described and couldn’t remember coming across it before. He spent some time conferring with senior engineers, then told us to check that the resistance across the thermistor was between 1.0 and 1.4 MΩ at room temperature. If the resistance was outside this range we should try replacing the thermistor, if within the range, and having checked the wiring connections between thermistor and PCB, we should suspect the PCB. The resistance across the thermistor was 1.0 MΩ (1.0 megohms; 1.0 million ohms), which was the normal range so we changed the PCB. If the boiler is already fitted with a Siemens PCB you can opt to change the PCB cassette only, or you can use the kit which changes the chassis, PCB and wiring loom. It’s expensive either way but since the full kit is only about £5 more we opted for the full kit and it resolved the problem.